Is October Really the Most Spiritual Month of the Year? Traditionally speaking October is a powerful spiritual month. Now is the time to tap into your spiritual inner self. October is known for its haunted feel. Every day the air feels more and more alive with energy. Often we sense a presence just behind us. It is not your imagination. Spirit activity is more prevalent now than any other time of the year. This dimension that we live in and the spirit world meets in October. This is the time that The Veil that separates us Thins. Learn details about the Magical Month of October in my Video. This is also a time for honoring your loved ones who have passed. Perhaps you may want to light a candle and recall in your heart the cherished memories of loved ones who are no longer in the physical world. Whatever you do make time to connect. The blessings can be enormous. If you would like to connect with a deceased love I can help you make that connection. Check Out My Services. A Mother’s Words From Beyond! The Message About The Crystal Punch Bowl. Every day is different in my work. I never know what to expect when a client contacts me and I would like to share an experience that I had with a client while working as a Psychic Medium. Cindy contacted me and asked for me to channel her mother two days after her passing into spirit. I never know when I start connecting to a deceased spirit what might happen. This client had contacted me previously for a psychic reading and needed information on how to help her mother pass into spirit. I was able to give her the much needed information, and her mother passed quite peacefully. The connection with her mother had already been established, and it was easy for me to reconnect with her. When a person dies, their spirit is still attached to the earthly plane for seven days and that is when it is easiest to channel messages. It is quite common for the deceased to want to communicate quickly with their loved ones after their passing. Cindy and I arranged a time when I could be on the telephone with her. I spent about 30 minutes prior to the call connecting to her mother. By the time Cindy and I were on the phone, messages were coming through strongly from her mother. Cindy wanted to know if her mother was at peace, and, of course, she was. Cindy was shocked and said, “What does this mean? I know the crystal punch bowl she is talking about.” I told her to wait and let the rest of the message come through. It was the most unusual thing I had ever heard from a spirit, and I was intrigued as to what would be revealed. I delivered this message exactly as I was told. Cindy let out a loud gasp and said, “That is what our mother did for us when we were children to entertain us.” Cindy began to cry because she knew that was a direct message from her mother to let her know that she was still around. Her mother told me how much she loved each one of her children and that she would never be far away. It was quite clear from her messages that she remembered them as young children and from her perspective in spirit that is what they are. As the session ended, Cindy was softly crying, but extremely happy with the direct messages from her mother. There are some channeling sessions that I have that leave a deep impression on me. 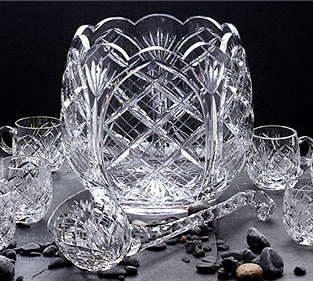 This is most certainly one of those, and I will always remember the crystal punch bowl. Remember your loved ones that pass into spirit are always close to you. Let me, Cherokee Billie , help you establish a connection for you with your loved ones. Death is a universal experience. No one can hope to escape it. It is only a matter of time till it comes to each one of us and those we love. Most death beds are peaceful when the time comes and few go out struggling. What, then, is it we fear in death that it should be for us a thing of grief and dread? Join Emily and me as we discuss this subject live on the radio and answer your questions during the program. If you are calling in please have your questions ready so we can answer them quickly and take as many calls as possible. Thank you! For those who cannot call in the chat room will be open for your questions and discussions. Please make note of this program Thursday, November 15 at 12:00 PM EST and 9:00 AM PST. This program will be available in the archives for you to listen to any time you desire.